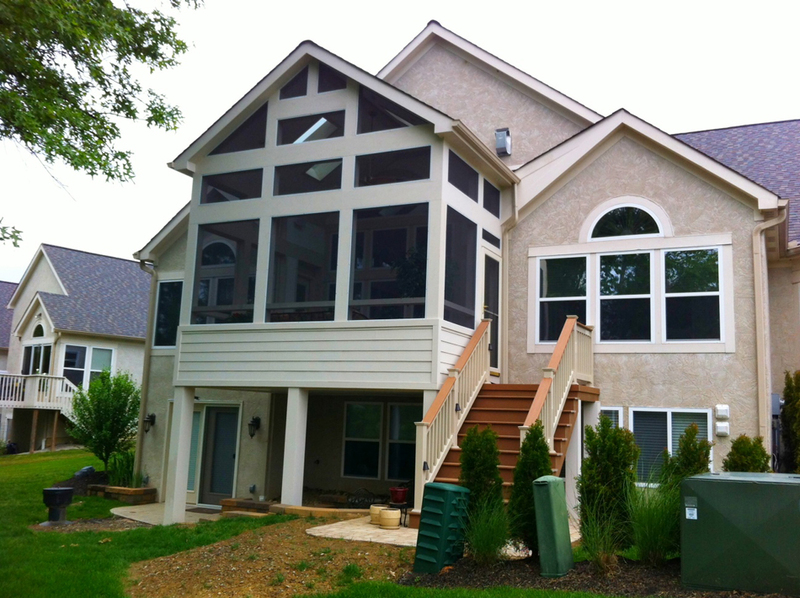 Our finished screened porch project in Delaware proves that screened porches aren’t “one size or style fits all”. This is what the deck looked like before we converted it to a screened porch. 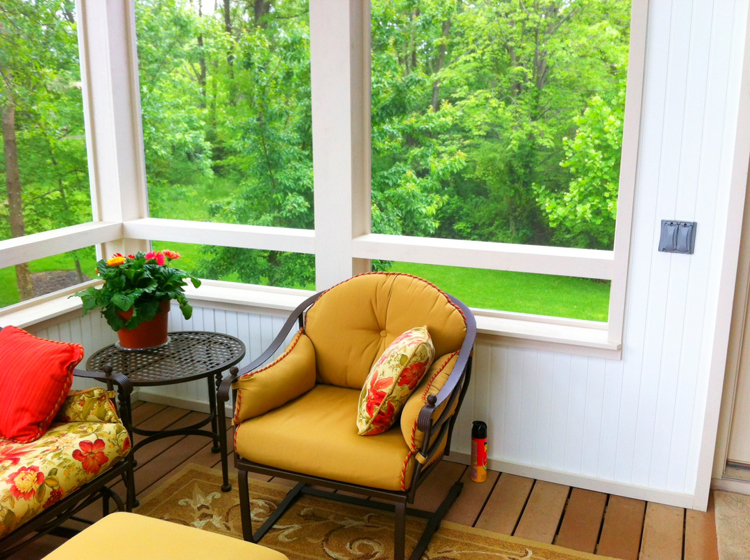 Our screened porch project in Delaware is finished and the homeowners are elated! 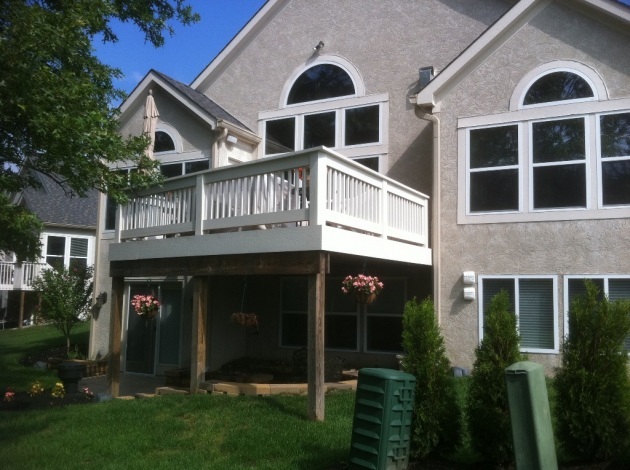 Not so long ago we covered a project we were working on in Delaware where the homeowners wanted to convert their existing deck into a screened porch. At first glance, this request seemed simple enough. The obvious choice was to just place the screened porch where the deck was using a gable roof to match the home’s existing gable style jut outs which were on the back of the home. Sometimes when really looking at roof connections and house connections the design and construction isn’t as simple as it appears to be. The view and the design of this screen wall, are breathtaking. Can you imagine having your morning coffee looking into this each morning? After looking at the roof connections, it became apparent that the drainage from the two adjoining gables would cause water to drain from those gables directly into the screened porch so we needed to find an architectural solution to overcome that obstacle. When other contractors would have told these Delaware homeowners the space wasn’t workable, we made it work with careful specifications and well thought out design. The large elevated screen porch was placed in the location of the homeowners existing deck, which includes a walkout below and serves as a patio underneath the porch as well. The scope of the job was to remove the old deck and build a screened porch that encompassed an area of about 12 x 14. We had to design a porch 13′ in the air for the roof tie in we were looking for. Because the home was part of a condo association, we had to ensure every facet of the new structure matched the existing home, this included the trim, exterior finishes, and everything else that was included in the new space. In matching the design to the existing home we wrapped the column supports with Pawlonia. We also used a kneewall with hardy plank for the exterior finish. On the interior, the customer chose PVC ply bead and an enclosed rafter system with a beadboard finish. 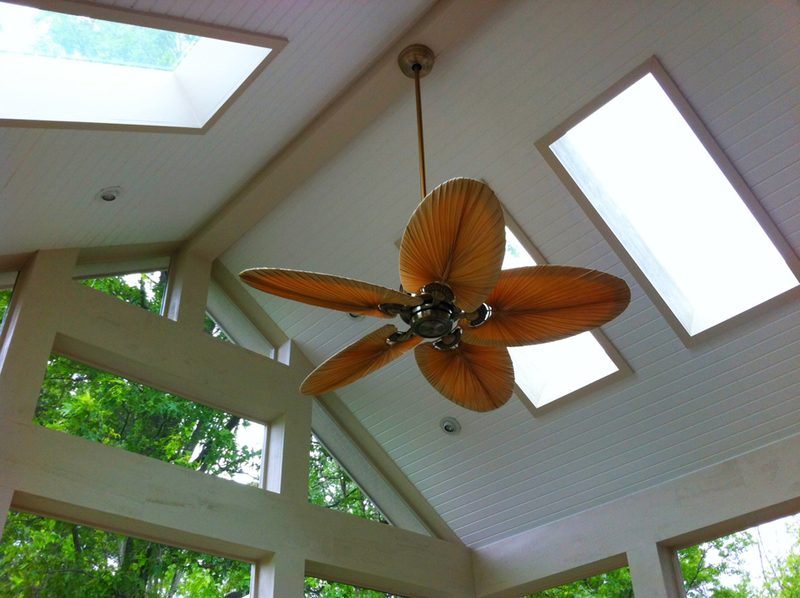 We installed four Velux skylights that provided lots of can lights, low voltage lighting, and a stunning ceiling fan. The flooring is Trex in saddle and so are the wide stairs leading down to the patio below. We used white vinyl railing to compliment the landing and stairs. Underneath the porch we installed a underdeck drainage system called Dry Snap. To add even more light and a chance to enjoy the clouds as they roll through a blue sky, we installed 4 Velux skylights. Archadeck of Columbus loves working with the client, the lot, the area we have to work with and any nuances or challenges we have to overcome to deliver you a finished product you are seeking. Interior details of the finished porch. 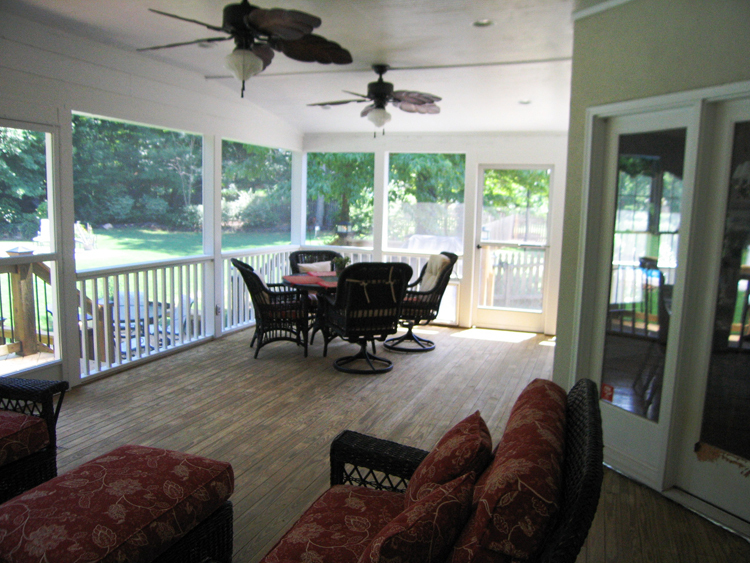 The finished screened porch is a beautiful, functional use of the space allocated by the previous deck’s location. The porch looks as though it was original to the home and boasts some of the most amazing views into the backyard. These Delaware homeowners could not be more pleased. You can see more stunning screened porches that double as works of art by visiting our screened porches photo gallery located on our website. Interior designs on screen porches-so many choices. 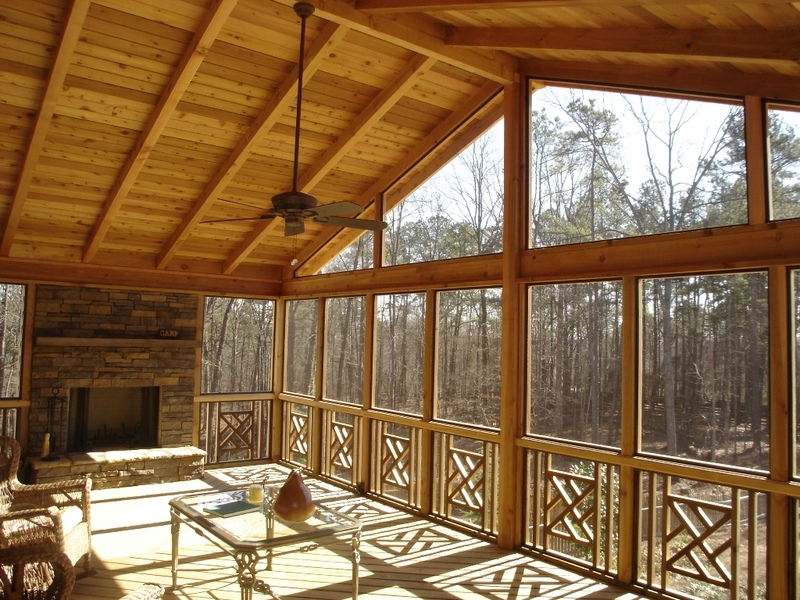 Archadeck of Columbus expands your knowledge of screened porch interior ceilings. There is more to a ceiling than meets the eye. This screened porch is big on rustic appeal by the choice of wood and the exposed rafter ceiling, even down to the details of the ceiling fans. As with any element of design in custom building, when you talk about the number of the choices that are available, screened porches are no exception. Screened porches can be constructed with simplicity in mind as well as sophistication. One area to consider using as a design focal point when building your screened porch is the ceiling. The area in which an interior ceiling covers is quite large, and is the perfect spot to add style and flair to your screened structure. There are a myriad of choices, styles, accoutrements, detailing and materials that can be used to finish your interior ceiling. Each one can be used to convey a feeling and a mood within your screen porch. Here are some very popular ceiling design elements to show what function each one carries out in order to make finishing out your screened porch a little easier. 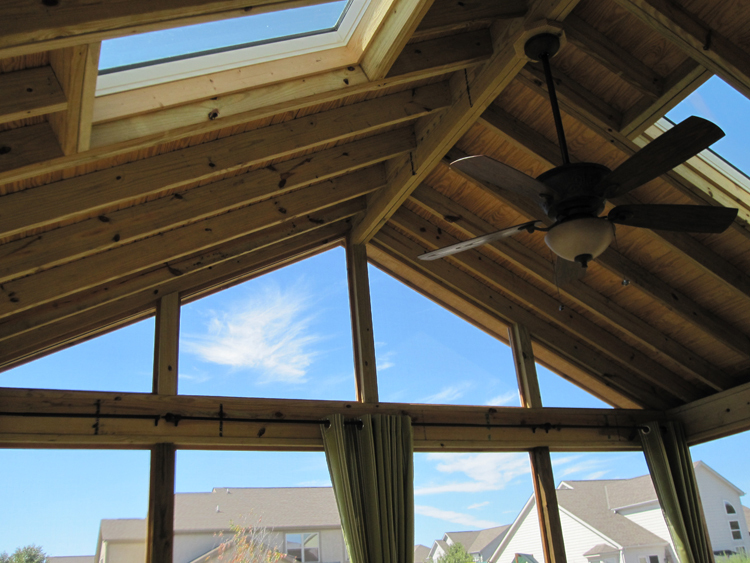 By using open, exposed rafters and skylights this screened porch by Archadeck of Columbus offers incredible views. Cathedral and clerestory ceilings– When choosing the elevation for your interior ceiling keep in mind that magic and the slight of hand is at work in some cases. For example, a room that has a higher elevated ceiling will appear and feel larger than it actually is. Cathedral ceilings give the room a sense of lightness and airiness. They also offer more room to use trim, moldings and architectural detailing. With an ability to allow room for these details in a higher elevated ceiling, you also get the “architectural reveals”, which in essence are effects caused by shadowing lines that can be induced through extra architectural details and lighting. These architectural reveals are used to add depth and ambiance to a room. 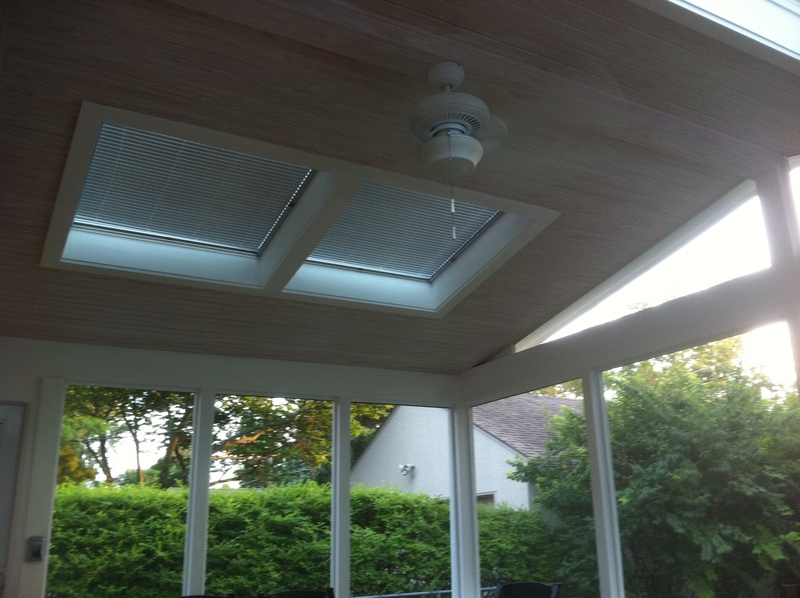 This screened porch by Archadeck of Columbus has enclosed rafters within the confines of a flat, finished ceiling. Flat ceilings– Flat ceilings are sometimes used to create intimacy inside a particular space, and can also be used to create a sense of unity or formality. Flat ceilings can be played-up by the use of hardwood finishes to achieve a rustic elegance. Gone are the days of the boring 8′ blown popcorn ceiling with no personality or pizzazz, now even a standard height ceiling of 8′ or 9′ feet and be finished to convey warmth and beauty within your screened porch. This is good example of exposed rafters used in a screened porch. 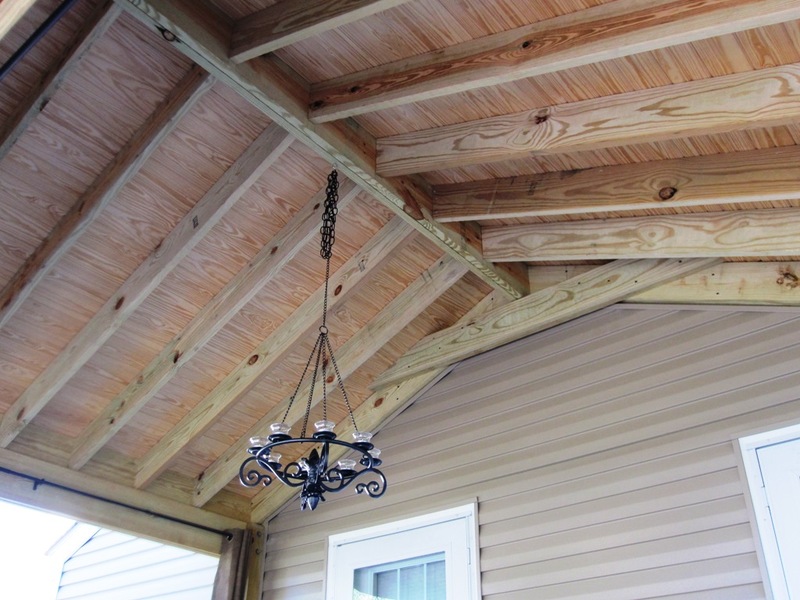 Exposed rafters– Exposed rafters are very popular among outdoor structures such as screened porches. Exposing the rafters creates a rustic, earthy elegance to the structure. Enclosed rafters– Enclosing the rafters is more expensive than leaving the rafters exposed. Enclosed rafters are still used to create formality to a structure. The decision to leave the rafter exposed or to enclose is a personal preference. So many choices– This is definitely an understatement. There are literally more material choices than you could ever imagine that are suitable for use in a screen porch. Some homeowners go with a more classic style, and others throw all caution to wind and really “think outside the box” in terms of using material choices as design elements. 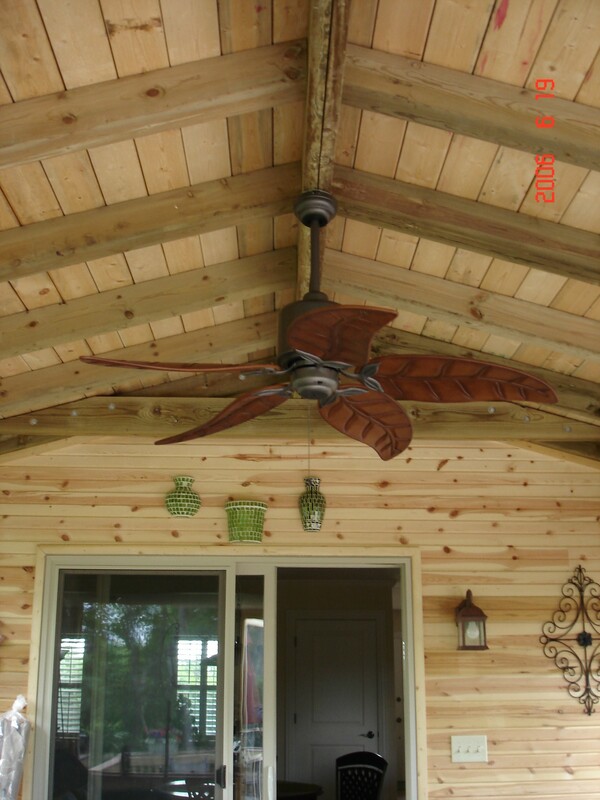 On the ceiling alone you have a wide array of materials to choose from like the wonderfully aromatic cedar tongue and groove, which carries on the rustic feel many screened porch owners are looking for. Then you have pine tongue and groove, which is less expensive than the cedar, but has a similar effect that is very natural and “woodsy. Using hardwoods on the ceiling are reminiscent of a “mountain lodge” type feel. There is also beadboard, which can be left natural or painted in the hue of your choice. Many homeowners choose a white-painted beadboard ceiling for their screened porch. White beadboard is clean, crisp and charming. A gabled ceiling and skylights add to this screened porch's charm. 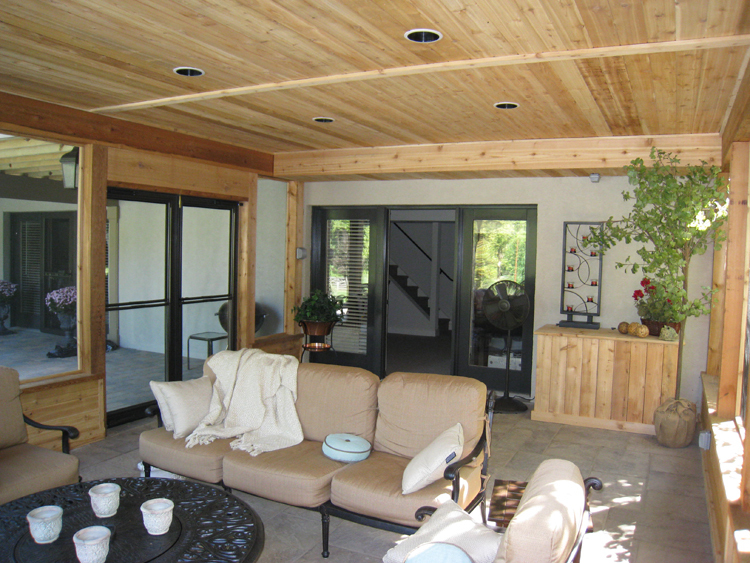 As with any material, each has its own price point– Pine is less expensive than cedar, beadboard is very popular among use as a ceiling material for screened porches. Beadboard can be less expensive than both pine and cedar depending upon the type of beadboard and the radius needed for your particular structure. This beauty by Archadeck of Columbus has a gorgeous tongue and groove ceiling. When leaving the rafters exposed the size of the rafter itself will greatly impact the look of your space. Larger rafters with more girth and presence reflect a masculine feel and also leave a bigger cavity within the ceiling itself. Wrapped rafters – by wrapping the rafters in a material like pine you can deliver style continuity and provide that rustic feel everyone is gravitating towards in design. Wrapping the rafters does cost more because wrapping the rafters will use more material as well as more labor. 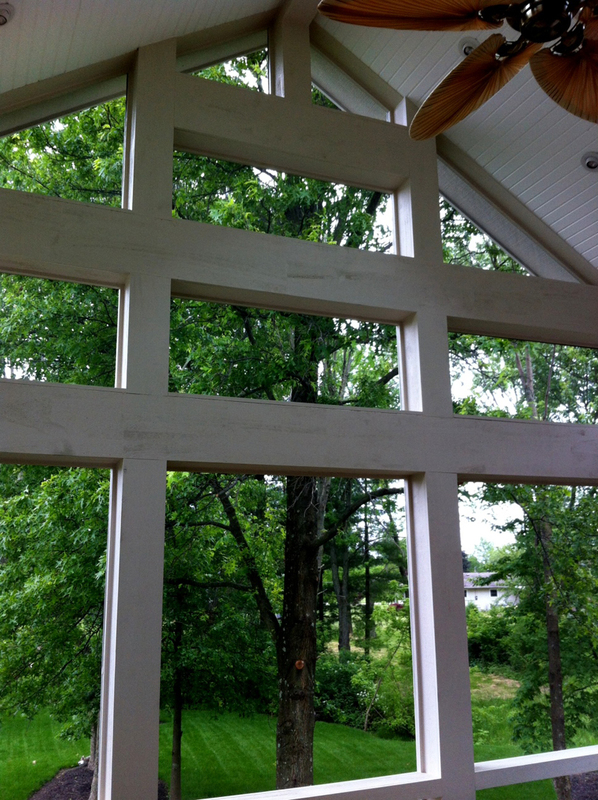 This screen porch is finished in cedar and uses exposed 4x6 rafters. Architectural elements– elements that can be used to add style and mood to your screened porch are important in a masterfully planned and built structure. Elements such as the ridge beam, which is the beam which runs the length of the ceiling, and in vaulted settings goes in-between the 2 opposite sides of the ceiling can become a focal point by using a large wooden beam. 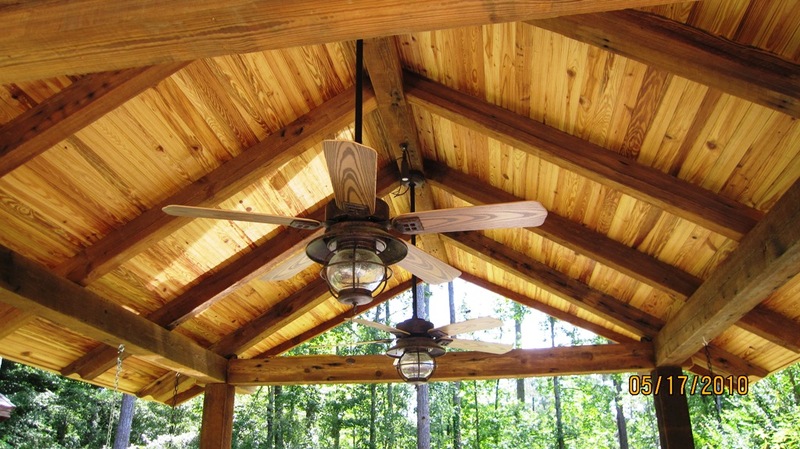 Ridge beams are also usually where the ceiling fan is most often mounted. Roof beams are the beams that run along the perimeter of the ceiling. Roof beams are sometimes trimmed out or wrapped to add some sizzle and style. The little extras really count– Options that can be added to your screened porch ceiling include skylights, ceiling fans, lights and multimedia devices such as speakers. We install a large amount of skylights for our clients and we use Velux. Velux skylights come with multiple options including built-in blinds that will open and close at the touch of a button, automatic sensors to close if the skylight is open and it detects the presence of one raindrop and much more. The little extras you pour into your individual structures ceiling can be as simple or as luxurious as you wish. With all screened porches you want to make sure you are using an experienced, licensed builder who has the knowledge and the design expertise to provide you with a screened porch that has your individuality built from the floor to the ceiling. Archadeck of Columbus has years of experience in perfecting the screened porch, and other outdoor structures, to learn more contact us at (740) 879 – 3730 westcolumbus@archadeck.net. To see more Columbus screen porches, visit our screen porch photo gallery on our website. Author archadeckofcolumbusPosted on September 14, 2011 September 14, 2011 Categories Building with cedar, screen porch, Screen Porches, Screen Porches Columbus, Screen Porches Columbus Oh, Screen Room Columbus Ohio, Screen Rooms Columbus Oh, Screened Rooms, Screened Rooms Columbus, Screened Rooms Columbus OhTags Archadeck of Columbus, choices in screened porch ceilings Columbus OH, outdoor living, Rustic Screen Porches, Screen Porches, Screen Porches Columbus Oh, Screen Porches Columbus Ohio, Screened Rooms, Velux skylights2 Comments on Interior designs on screen porches-so many choices.